Since the latest release of chrome (34.0.1847.116) last week, I have been receiving the “Disable developer mode extensions" when running automated tests using watir-webdriver. This seems to be the offensive extension but it doesn't make sense to me that this is a potentially hazardous extension given its used by the chromedriver. Anyone that has found a fix for this, as i am unable to roll back to the previous version or find an installer for an older version to roll back to and this is playing havoc with my tests. 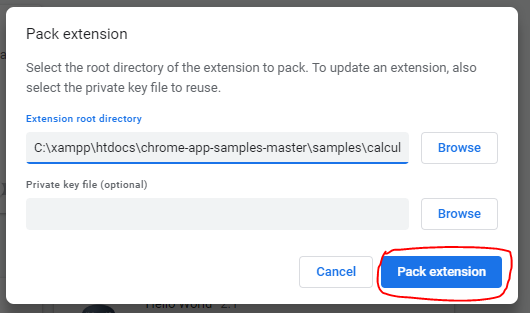 Pack your extension (chrome://extensions/, tick at 'Developer mode', hit 'Pack extension...') and install it via drag-and-dropping the .crx file into the chrome://extensions page. As of July 2018, this approach no longer works: it seems Google has stopped honoring the "whitelist"
2.Uninstall the extension you installed (To be precise the extension that causes the popup) using the "Load unpacked". 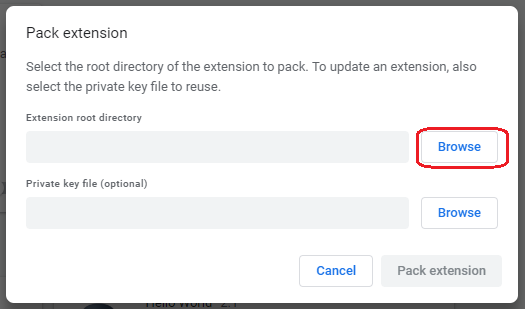 3.Click on pack extension and enter the root directory of the files (put the extension files in a single folder/one folder per error causing extension) don't enter the private key file if you don't have it. 4.Click pack extension a .crx and .pem file would be created near the root directory of the extension. Install the extension using the crx file and keep the pem file safe (if you delete it or something goes wrong without it you can always repack the extension). 5.Then copy the crx installed extension ID to the whitelist and restart Chrome. The popup should be gone. While creating chrome driver, use option to disable it. Its working without any extensions. As of May 2015 Chrome beta/dev/canary on Windows (see lines 75-78) always display this warning. I've just patched chrome.dll (dev channel, 32-bit) using hiew32 demo version: run it, switch to hex view (Enter key), search for ExtensionDeveloperModeWarning (F7) then press F6 to find the referring code, go to nearby INC EAX line, which is followed by RETN, press F3 to edit, type 90 instead of 40, which will be rendered as NOP (no-op), save (F9). Of course this will last only until the next update so whoever needs it frequently might write an auto-patcher or a launcher that patches the dll in memory. Can't be disabled. Quoting: "Sorry, we know it is annoying, but you the malware writers..."
Your only options are: adapt your automated tests to this new behavior, or upload the offending script to Chrome Web Store (which can be done in an "unlisted" fashion). Extract "chrome.adm" in the language of your choice from the "policy_templates.zip" downloaded earlier (e.g. "policy_templates.zip\windows\adm\en-US\chrome.adm"). Navigate to Start > Run: gpedit.msc. Navigate to Local Computer Policy > Computer / User Configuration > Administrative Templates. Right-click Administrative Templates, and select Add/Remove Templates. Add the "chrome.adm" template via the dialog. Once complete, Classic Administrative Templates (ADM) / Google / Google Chrome folder will appear under Administrative Templates. No matter whether you add the template under Computer Configuration or User Configuration, the settings will appear in both places, so you can configure Chrome at a machine or a user level. Once you're done with this, continue from step 5 of Antony Hatchkins' answer. After you have added the extension ID(s), you can check that the policy is working in Chrome by opening chrome://policy (search for ExtensionInstallWhitelist). Close Chrome, and then open it again. Don't put the .crx and the .pem in the folder of the unpacked extension. When I reopened Chrome, I got a popup that told me about the new packed extension, so I rebooted Chrome to see if it would do it again, and it did not. I hope this solution worked! The disable extensions setting did not work for me. Instead, I used the Robot class to click the Cancel button. // As long as you don't move the Chrome window, the Cancel button should appear here. 1) Wait for the popup balloon to appear. 2) Open a new tab. 3) Close the a new tab. The popup will be gone from the original tab. With this extension installed, launch Chrome and immediately switch apps before the popup appears... a few seconds later, the popup will be gone and you won't see it when you switch back to Chrome. I'm not sure if this is still a problem for people or not. However, I read through this post and several others and finally played around with this and was able to make it work in C# using this code. I derived it all from this post and possible some posts linked to this post. I hope this helps, it certainly solved my problems in C# console application. Go to chrome://extensions page and click Pack extension button and select your root Directory of extension by clicking on red rectangled browse button displayed in below image. after selecting root directory Click on Pack extension button displayed in red circle in below image. Now in check parent directory of your selected root directory of extension, 2 file would have created [extension name].crx and [extension name].pem. Now just drag and drop the [extension name].crx file onto the chrome://extensions page and it will ask using add app dialog box click on Add app and refresh the page it is installed now. Note: Before doing anything as above make sure to enable Developer mode for extensions. If this was not enabled, refresh the chrome://extensions page after enabling it. // Prevent warning about dev tools, which breaks some tests, in Windows at least. Unfortunately I cant automate setting it to developer mode because of restrictions in width using the browser in iphone mode. I have found a dangerous workaround for now, install the dev channel version of chrome. It does not have the warning message, but im sure it will cause me more problems in the long run when problems are introduced. Still will hopefully give me a few days to find a workaround. The popup 'Disable developer mode extensions' will not pop up. Not the answer you're looking for? Browse other questions tagged google-chrome google-chrome-extension watir-webdriver selenium-chromedriver or ask your own question. how to enable developer mode for extension in chrome? How to modify an installed extension on Chrome?